There comes a time in all accounts receivable professionals’ careers whey they come across a truly challenging overdue account. Whether there is a dispute, or the customer flatly refuses to pay. Everyone in an accounting department has dealt with it. The question that many of them are torn over is whether or not to pursue legal action against their customer. The goal of this blog is to help you answer that question by helping you make an informed decision. When deciding on pursuing legal action over an overdue account you should first answer these five questions. Have I exhausted regular collections methods? In most cases when the decision to go the legal route has been chosen the decision maker usually has tried everything else. They’ve sent notices and invoices, made several collection calls, and may have even had a third-party collection agency try to recover the overdue account. Legal action can often be viewed as the last option and as such every other option should be explored first. Are there any unresolved disputes? Whether or not you feel the initial dispute is justified you must first hear it out. While they can sometimes be used as a stall tactic most disputes are legitimate. Working with your customer is the only way of determining which one it is. If you can resolve the dispute you can avoid legal action and save money, but if the dispute is a stall tactic then being served with legal documents may be all it takes to spur your customer into resolving the overdue account. If you’ve done all you can, and the dispute is still not resolved then legal action may be the only way to resolve it. Has your customer ignored collection notification or broken their promises to pay? Ignored collection calls and broken payment arrangements are red flags and indicate legal action may be the best option. These behaviours can indicate that your customer is actively trying to avoid you or being dishonest with you; however, there can be circumstances where your customer legitimately never received your notifications. Pursuing legal action can remedy this because the documents are required to be delivered by hand and sometimes that is enough for your customer to take your requests for payment seriously. Does your customer own property? The judgment you are awarded from suing somebody should be registered against a property that they own. This means the judgment must be paid out before a transaction to sell the property can be completed. It is for this reason that it is generally not recommended to sue someone who does not have property because there is nothing to register the judgment against. Legal action can be expensive and suing someone with no property may not be beneficial. Is the balance of the overdue account high enough to warrant the cost of legal action? 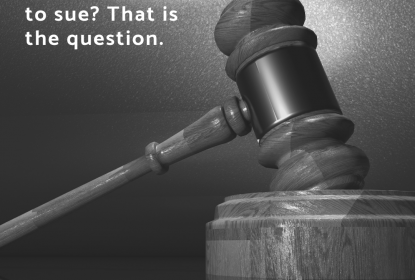 Going through the process of suing someone can be a costly venture, you need to make sure the amount of the overdue account will justify the costs you will incur. Deciding to pursue legal action against a customer with an overdue account is a difficult decision to make. When making it be sure to answer these five questions first: Have you exhausted all methods of collection?, Are there any unresolved disputes?, Has your customer ignored collection notifications or failed to deliver on promises to pay?, Does your customer own property?, Is the balance of the overdue account high enough to warrant the cost of legal action? Once you’ve answered these questions the answer to whether or not you should sue should be revealed. © 2019 Eastern Credit Management Services A Division of Eastern Collection Services Ltd.